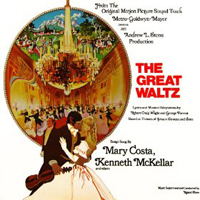 London Cast, 1970 (Columbia/no CD) (2 / 5) Edwin Lester’s Waltz was the impetus for this production at London’s famous Theatre Royal, Drury Lane. 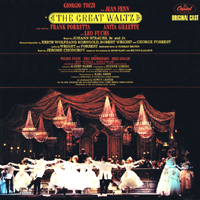 With a few textual changes (Julius Bittner is added to the songwriting credits), it ran for 706 performances. 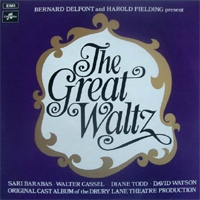 The cast album features an overture that’s not included on the earlier recording, and there are other differences in the song stack. Sari Barabas, a genuine European operetta star, exudes Continental flair in a gorgeously sung, heavily accented “I’m in Love With Vienna,” and she could not possibly be more playful or charming in “Teeter-Totter Me” with the sturdy-voiced David Watson as Strauss, Jr. Watson also works well with the Resi of Diane Todd, whose soprano is fluttery yet attractive. As the elder Strauss, Walter Casell displays a huge, mature baritone of great authority. The quartet for the principals gets a little wild, but the finale has Todd and Barabas doing some lovely trilling of the famous “Blue Danube.” — J.D.